Rip-offs are a dangerous game, but heist man Miles Keller thinks he's found a good strategy: rob rich New York criminals and then retire early, before word's out about his true identity. New town, new name, no worries. Retirement can't come soon enough, though. The NYPD is investigating him for the shooting of a hitman named Jack Deen, who was targeting Lucy Gates - a former police informant and Miles's ex-lover. 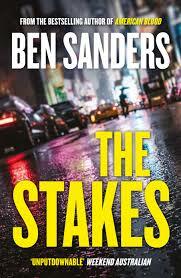 “And it’s like: you know on kind of a formal level that there’s laws, but then when you’re actually on the street and see it through their eyes, you realise it’s just dog-eat-dog, same as everything else” – even the cops don’t have a clear line on right and wrong in Ben Sanders’ latest novel, The Stakes, and most of his characters are conflicted, confused and making their moves “So you feel the strange weight of the strange moment”. Miles Keller is an NYPD detective currently under investigation for a shooting. Keller has more at stake than the authorities finding out the shooting might not have been righteous; he has been ripping off bad guys for quite some time – since his wife left him over a brief affair with a confidential informant, Lucy Gates, who was also involved in the shooting. And the victim of the shooting has a cousin, Bobby Deen. Bobby is a failed actor who has ended up working for a crooked high-flyer Charles Stone, who launders his money through making movies. Bobby usually makes sensible calls, but when Stone’s wife Nina sets out to rip off her husband and Bobby is sent to retrieve her, he starts getting brain fails when he is around the charismatic Nina. Miles and Nina have a history – her latest heist not being her first – and Miles being the cop who helped her avoid going down for a previous outing. When Nina catches a glimpse of Miles in New York, all the players are set on a collision course, with each having high stakes on the table – money, freedom, love, staying alive … Confused? … Well, you will be for most of this novel. But just revel in the homage to Leonard’s narrative style; in enjoying the characters, who know how they’re coming across – “This would be a long exercise in deadpan, but it was hard sticking to a cool tempo, his heart rate up and his breath coming short”, and who often inwardly falter as they fail to come up with the final witty riposte. The only character in The Stakes who isn’t at heart out to do ‘the right thing’, is Nina – she’s in it purely for the money: “… I’m always in charge … I’m just not used to people figuring it out”, but who she’s going to back to help her get the goods is an open question. If you haven’t read Ben Sanders, do – he just gets better and better. Alyson Baker is a crime-loving librarian in Nelson. This review first appeared on her blog, which you can check out here. I am a New Zealand features writer and book reviewer with a particular penchant for a well-told crime tale.